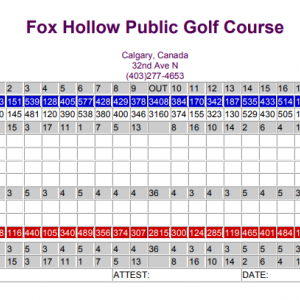 Since 1989, Fox Hollow Golf Course has been offering Calgary public golfers an affordable well designed 18 hole course for all levels of ability, with large and playable greens. Because we’re only 10 minutes from downtown Calgary, you can be warming up for your round or on the course in no time at the end of the workday. Relax with a drink or meal afterwards on our patio or inside Mulligan’s’ Food and Spirits. Book your tee time now and enjoy some of the best golf in Calgary at these affordable rates. Tee times are booked up to 5 days in advance by calling 403-277-4653. Or 6 Days in Advance ONLINE !! Keep in mind you may book Saturday, Sunday and Holiday Mondays on the previous Tuesday over the Phone.